Bilevel programs model hierarchical non-cooperative decision processes with two decision makers, the leader and the follower, who control different sets of variables and have their own objective functions with interdependent constraints. Bilevel programs are very difficult to solve and even the linear case is NP-hard. 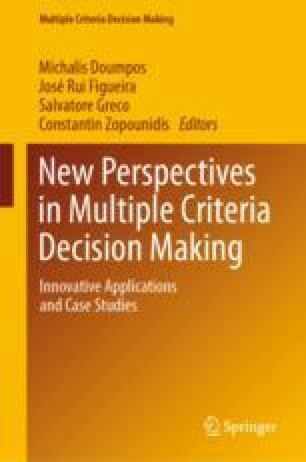 In this chapter, a novel view on the main concepts in multiobjective and semivectorial bilevel problems is offered, including new types of solutions that are relevant for decision support. Optimistic and pessimistic leader’s perspectives are explored; the extreme optimistic/deceiving and pessimistic/rewarding solutions in semivectorial problems and the optimistic Pareto fronts in multiobjective problems are defined and illustrated. Traditional and emerging application fields are reviewed. Potential difficulties and pitfalls associated with computing solutions to bilevel models with multiple objectives are outlined, shaping possible research avenues. This work was supported by projects UID/MULTI/00308/2019, ESGRIDS (POCI-01-0145-FEDER-016434) and MAnAGER (POCI-01-0145-FEDER-028040). Alves, M. J., & Antunes, C. H. (2016). An illustration of different concepts of solutions in semivectorial bilevel programming. In 2016 IEEE Symposium Series on Computational Intelligence (SSCI) (pp. 1–7). https://doi.org/10.1109/ssci.2016.7850219. Alves, M. J., & Antunes, C. H. (2018a). A differential evolution algorithm to semivectorial bilevel problems, machine learning, optimization, and big data. MOD 2017. In G. Nicosia et al. (Eds. ), Lecture notes in computer science. Cham: Springer. https://doi.org/10.1007/978-3-319-72926-8_15. Alves, M. J., & Antunes, C. H. (2018b). A semivectorial bilevel programming approach to optimize electricity dynamic time-of-use retail pricing. Computers and Operations Research, 92. https://doi.org/10.1016/j.cor.2017.12.014. Alves, M. J., Antunes, C. H., & Carrasqueira, P. (2015). A PSO approach to semivectorial bilevel programming: pessimistic, optimistic and deceiving solutions. In Proceedings of the Genetic and Evolutionary Computation Conference (GECCO 2015) (pp. 599–606). https://doi.org/10.1145/2739480.2754644. Dempe, S. (2009). Bilevel programming: Implicit function approach. In C. A. Floudas & P. M. Pardalos (Eds. ), Encyclopedia of optimization (pp. 260–266). Boston, MA: Springer US. https://doi.org/10.1007/978-0-387-74759-0_44. Lv, Y., & Wan, Z. (2014). A solution method for the optimistic linear semivectorial bilevel optimization problem. Journal of Inequalities and Applications, 2014(1), 164. https://doi.org/10.1186/1029-242x-2014-164. Sinha, A., Malo, P., & Deb, K. (2015). Transportation policy formulation as a multi-objective bilevel optimization problem. In 2015 IEEE Congress on Evolutionary Computation (CEC) (pp. 1651–1658). https://doi.org/10.1109/cec.2015.7257085. Xu, J., Tu, Y., & Zeng, Z. (2012). A nonlinear multiobjective bilevel model for minimum cost network flow problem in a large-scale construction project. Mathematical Problems in Engineering, 40 (Article ID 463976). https://doi.org/10.1155/2012/463976.